Exhausted and nauseous, I wobble on weak ankles as D, C and I walk along the stables to D’s car. The paved surface below my feet is a refreshing change from that of the rest of the fairgrounds. The smoothness is, admittedly, a little disorienting; after being thrown and flipped for the better part of the day, I can’t help but anticipate some hazard looming on the horizon. So, I’m anxious. Each foot is placed with heightened uncertainty as I feel increasingly more sure that the ground will suddenly fall from beneath my feet. I’m scared because I don’t know what to expect next – I just can’t be positive – and even more frightening is the thought of slipping into the passenger seat of D’s blue sedan. He’s already a scary driver, so who knows how watching the figure-8 race will affect his tendencies? If I even make it the parking lot, anyway. Ah, the 4-H fair. What strange wonders it holds… Such a curiosity it is… Simple newspaper ads shout reminders and inspire promises as parents begrudgingly set dates on their calendars and pray that their children forget. But alas, mid-July, small rectangular signs are erected along road sides to announce the fair’s advancement. There will be no forgetting now. I remember those days well. Those days when I would reduce myself to tears just to try to make my parents give in to my desires. Surely just one more ride would be acceptable. Or perhaps one more game? But now, as I stand in line for another ridiculous ride with a once-coveted wristband adorning my arm, I question and chide my childhood self. Why would one subject themselves to such pain for such a high price? After flipping and spinning on my so-called favorite rides for a just matter of minutes, I’m ready to be done. Wandering down the fairway, a harsh mix of gravel and dirty sand bubbling up into my sandals, I swallow my stomach and escape the crowd to seek salvation within the horse barn with my cousin, N.
I appreciate the animals on show here now more than anything, and unlike the rides, there’s no fee to see them (well, except the $10 parking pass). Sure, sometimes they stink, but each animal at the fair was raised by someone under the age of 20. And we’re talking some pretty substantial animals; pigs, cows, goats, chickens, horses… Animals that took a lot of time and hard work to bring up. To me, that’s way more interesting than a line of whining kids at the Zipper. Which is another thing I like; the kids in the barns are often too young to ride the rides, and it’s incredibly cute to see them react to how big cows, pigs and horses really are. They’re amazed and completely in awe. Better than sickened and completely green, right? It’s just funny to me. I know it’s a common theme to my posts, but things are changing. I don’t have children of my own (and I’m certainly not in a rush to have any! ), but I’m starting to see what my parents went through while they were raising me and it makes me really, really, really appreciate them. Yeah, they denied me tickets and cash at the fair. Yeah, I was disappointed and pouted the whole way home. But you know what? That was good for me. I needed that. It’s got to be difficult to say no to your kid (and I’m sure that my parents lost lots of sleep over it. Haha), but I understand why it needs to be done. Sometimes “no” hurts, but it’s the right answer in the long run. Some things just have to be denied so all things are not expected. That said, we all need limitations and restraints if we are expected to become civilized adults. They keep us back in our seats, face-to-face with reality, and safe at all times. This cake is very rich, but sooooooo good. I know it’s swimsuit season. Please forgive me! Place the chocolate in a medium-sized bowl and set aside. Bring cream to a boil in a small saucepan and when it begins to bubble up, pour over the chocolate and let sit for 5 minutes. Gently stir, starting in the middle and working your way outward, until the cream and chocolate are completely mixed. Cover with plastic wrap and set aside. Preheat oven to 325F (160C) and line the bottom of a 10″ round cake pan with ungreased parchment paper. In a medium bowl, sift together confectioners’ sugar, flour and cornstarch. Set aside. In a large bowl, beat egg whites, cream of tartar, and salt until frothy. Increase speed to medium-high and gradually sprinkle in sugar, then extracts, beating until stiff peaks form. Sift half of the flour mixture over egg whites and fold until just combined. Sift over the remaining half of the flour mixture and gently fold until no streaks remain. Pour batter into prepared cake pan and bake until top of cake springs back when touched, 45–50 minutes. 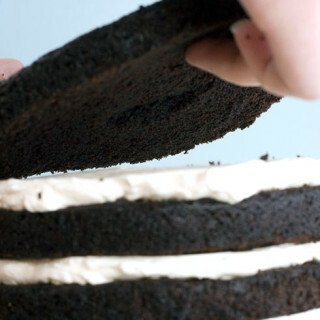 Transfer cake to a rack and let cool. Preheat oven to 350F (175C). Grease a 10″ round cake pan with shortening and dust with flour to coat. Shake out excess flour and set pan aside. 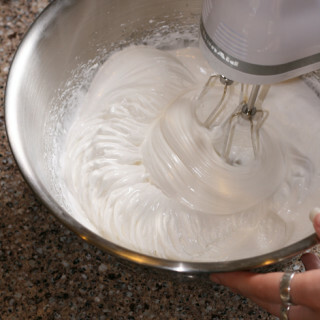 In a medium bowl, whisk together flour, cornstarch, baking soda, salt, and baking powder. Set aside. In another medium bowl, whisk the coffee and cocoa powder until smooth. Set aside. In a large bowl, beat the shortening, sugar, vanilla, and eggs with a handheld mixer on medium speed until pale and fluffy, 2 minutes. Alternately add the flour mixture and the coffee mixture to the bowl in 3 stages, beating to combine after each addition. Pour the batter into the prepared cake pan and bake until a toothpick inserted into cake comes out clean, 30–35 minutes; transfer to a rack and let cool completely. In a large bowl, beat cream cheese, peanut butter, and confectioners’ sugar on medium speed until smooth and fluffy, about 3 minutes. 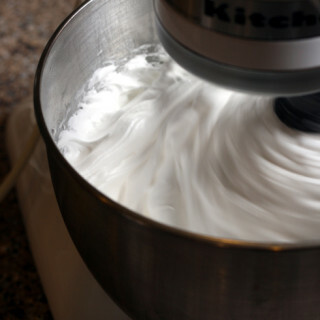 Put cream into a large bowl and beat on high speed until stiff peaks form. Using a rubber spatula, fold 1/3 of the whipped cream into the peanut butter mixture to lighten, then fold in remaining 2/3rds. Cover and chill until ready to use. 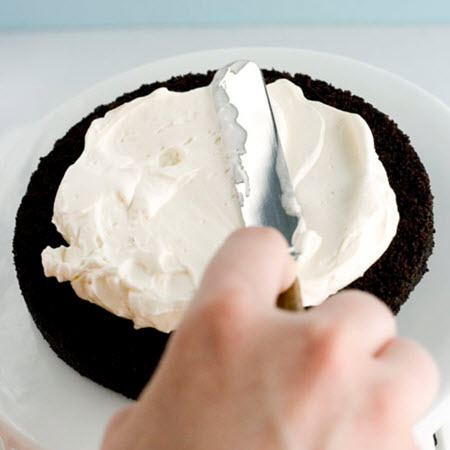 Using a serrated-blade knife, slice each cake horizontally into 2 layers. 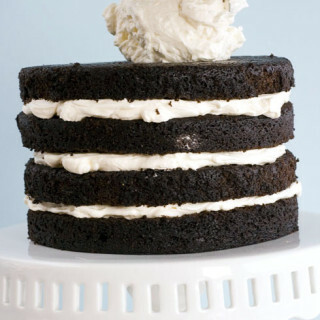 Place 1 layer of the devil’s food cake on a cake stand and spread 1/3 of the peanut butter mousse over the top. Top mousse with a layer of the angel food cake and spread with half of the remaining mousse. Repeat with the remaining devil’s food cake, mousse, and angel food cake. Wrap cake in plastic wrap and freeze for 2 hours. Stir ganache (heat it in the microwave, if necessary, at 10 second intervals. Be sure to stir well) until smooth and pour over the top and sides of the cake, smoothing with a palette spreader if necessary. 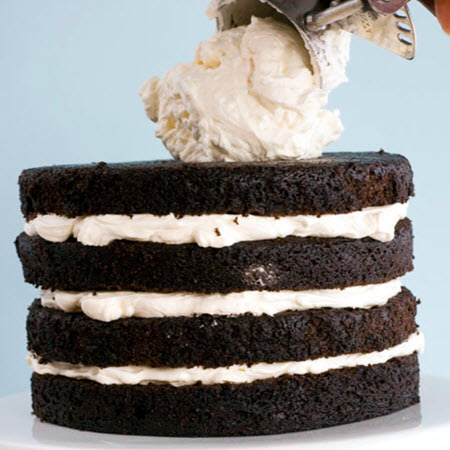 Refrigerate the cake for 2 hours before slicing. Now, this cake is breathtaking. But not as breahtaking as the Zipper. Is there anything more terrifying? Yikes. Our fair was (and still is) in mid-August, and it&#39;s still hotter than blue blazes. Parking is free, too. 🙂 <br /><br />Great post, as always! What a well-written post. You took me right back to those days at local fairs and carnivals. And reminded me of how great my mom is for having put up with us all! 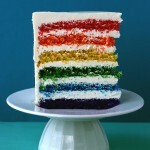 : )<br /><br />This cake looks stunning and positively delicious. Glad you&#39;ve shared the recipe! Wow, this cake looks amazing! It&#39;s nice to see fellow food bloggers my age too (I&#39;m 19 as well!). Great job! I LOVE the name of this cake, haha! Love your writing too!! Gorgeous photos! 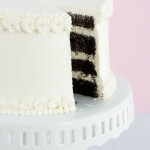 Stunning cake – I like your style.<br /><br />Stop by my blog when you get a chance:<br />www.form5artisan.blogspot.com<br /><br />Cheers!<br />Christina. Mmmmmmm. Breakfast today is a piece of this absolutely delicious cake and some wonderful coffee made by my lovely Whiskkid daughter. It has peanut butter in it, so that makes it healthy right? 😉 Yummy cake Sweetie. Wow, making such a cake takes proper dedication. It&#39;s absolutely gorgeous. Great post! 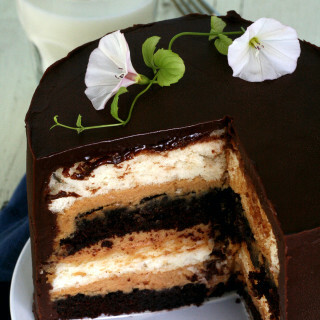 This cake looks amazing…I&#39;m drooling over the key board as I type…do you think it would be to much chocolate if I replaced the peanut butter filling with a choc. mousse, we have peanut allergies in our house 🙁 Or do you have another suggestion for a filling that would taste delicious? This looks so good I want to slap you! Now I&#39;m just going to see if I can make this gluten free! Wow! Cake looks GREAT! It made me think you used peanut butter AND jelly. Now, that&#39;s a good idea, too!<br /><br />Thinking I might purchase an angel food cake, make the devil&#39;s food cake and then do layers of the angel cake, devil&#39;s food cake, peanut butter mousse and put some jelly in there!<br /><br />thanks for the inspiration! Lovely writing. Your post reminds me of one of my favorite essays by David Foster Wallace. It was published in Harper&#39;s under the name &quot;Ticket to the Fair.&quot; It resonates really well with what you&#39;re talking about…something that&#39;s supposed to be fun, but isn&#39;t. <br /><br />You have a wonderful blog, here. Keep it up! You&#39;re amazing…love your writings. But also love your Mom&#39;s comment about how healthy this Heaven and Hell cake is. I agree. Yes, as one very smart writer said, &quot;we all need limitations and restraints if we are expected to become civilized adults&quot; but not when it comes to this cake. Must have, so must make. I can&#39;t wait for the Great MN Get Together! Bring on the Fair! Oh man! This is one heck of a beautiful cake!!! This is just over the top fantastic!!!! Swoon! Now that&#39;s a killer combination- Just light enough to know be cloying, but decadent and rich all at once. I can&#39;t imagine anyone being able to turn down such a temptation! All of those layers together are just stunning. I fell in love with your cake the instant I saw it. I tried looking for other recipes, but that&#39;s definitely the cake I&#39;m making for my boyfriend&#39;s birthday. Thank you! This is one of the most amazing looking cakes I have ever seen. How the heck do you get the ganache so smooth??? 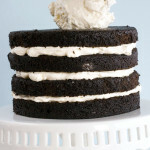 I am making this cake this week! Although I will have to save the peanut butter mousse for another day …Boo to peanut allergies my poor friends don&#39;t know hwat they are missing out on. :O) I will have to substitute cheesecake mousse filling instead I guess. GORGEOUS CAKE. I wish I&#39;m as talented as you!!! 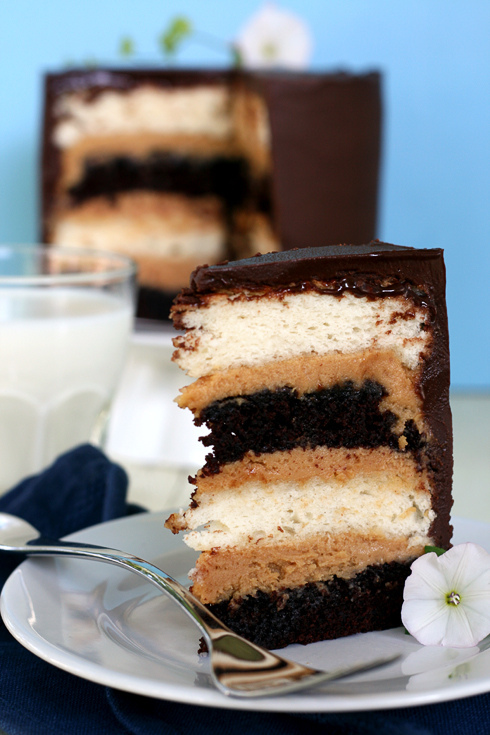 Made this cake yesterday except replaced the peanut butter with nutella. Best cake I&#39;ve ever had. Only problem was that the angel&#39;s food cake fell apart under the weight of everything on top of it. Soooooo rich and good. I could never go on the zipper, I hate rides that spin. I&#39;m really not one for rides at the amusement park anyways, can&#39;t stand feeling nauseous. <br /><br />Anyways, the cake looks delicious! The idea of a peanut butter mousse sounds intriguing. Sometime&#39;s I come to your blog to look at all of the &quot;pretty pictures&quot;. This is my current favorite. I&#39;m drooling. I also feel like I&#39;ve gained 10 lbs. just dreaming of this baby. I&#39;m making this A.S.A.P! wow! Wow!!! I died and went to heaven?????? Thanks so much, guys! <br /><br />I am glad you liked the cake, Stephanie. Thanks for the notes! Looks great. <br />Unfortunately, the Angel Food Cake recipe didn&#39;t work out for me at all. 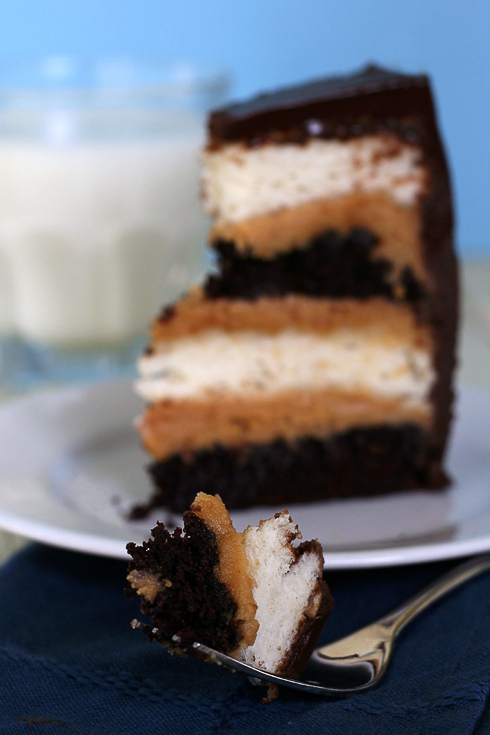 Had to throw it out and serve the Devil&#39;s Food Cake with the Peanut Butter Mousse.<br /><br />Will give it another try… with a different recipe for the Angel Food Cake. I guess. Anonymous, I&#39;m sorry to hear that the angel food cake didn&#39;t work out. I wonder what went wrong…? Hopefully you&#39;ll have better luck in the future! I did it!<br />It is absolutely wonderful, soft texture, delicious… wordless<br />Best cake I&#39;ve ever tasted before! Thanks! Ju, your cake turned out fabulously 😉 I am glad that you liked it! Thanks for emailing me, anonymous! Could you make these into cupcakes? 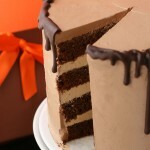 I&#39;m trying to figure out how I would layer it and cover it in chocolate without getting too messy. I just made this cake without the angel food cake. It&#39;s ah-may-zing!! I have an un-natural hatred of angel food cake, so I skipped that part and made 3- 6 inch devils food cakes and layered as specified. It tastes great and looks great too. <br /><br />The only thing, is I have a ton of peanut butter filling and ganache left over. I think I could have quartered the recipes. fabulous + completely over the top gooey goodness. thanks for a great recipe! I can&#39;t wait to try this recipe! <br />Think I&#39;m going to make it for our church fundraiser… LOL! !<br /><br />I just had a question and I didn&#39;t see it over on the &quot;Tips&quot; section. I have (2) 8&quot; pans. How can I adjust the ingredients for my pans. Is there a ingredients Calculator you use? Also, How high do you fill your pans? Same as Cupcakes.. 2/3 full? I love that you&#39;re making it for church! Too funny.<br /><br />In your situation, I would avoid sketchy math + the potential for partial eggs and other strange measurements and just make the recipe as provided. Fill the tins, yes, about 2/3 full (Maybe a bit less for Angel Food) and use the rest of the batter for cupcakes. Happy baking! Did u use all purpose flour or self rising? Mousse turned out odd….kinda curdled looking. Still tastes good. Any tips or comments on why that might be? 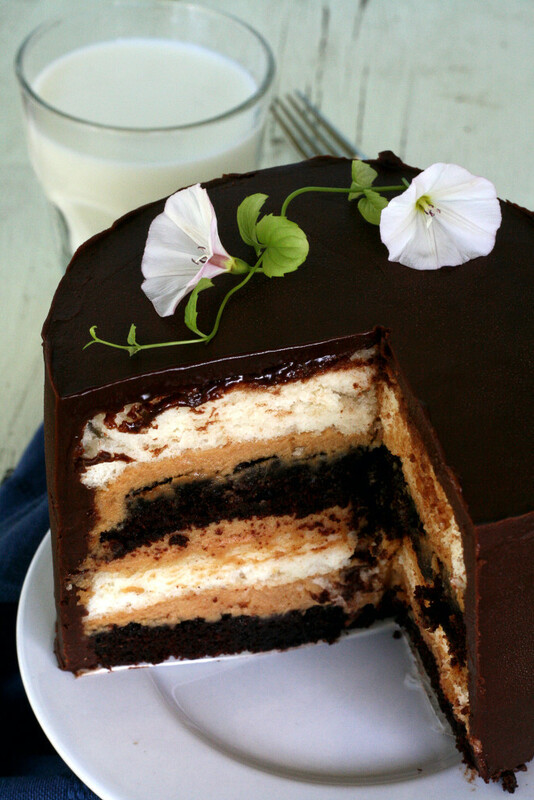 This cake looks insanely delicious! I will be making it for a party this weekend with just a minor tweak. Instead of all the filling layers being peanut butter mousse, I’m going to use fig preserves for 1 or 2 layers along with the peanut butter mousse. As a kid, one of my favorite things in life was a sandwich made of grandma’s fig preserves mixed with peanut butter. I can’t wait to have that first (and second!) slice! That sounds like an incredible modification, Anjanette! How did it turn out?! It sounds so tasty! Thank you so much, Jennie Leigh!! If you make the cake, I’d love to see it!